Creates a perfect edge every time! A. Creates double edge on bottom pot. B/D. Used to round out squared edge on lip of pot. 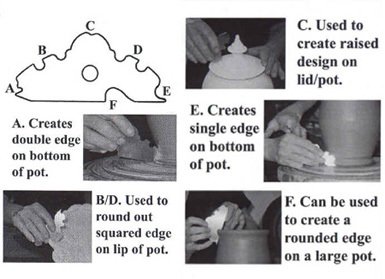 C. Used to create raised design on lid/pot. E. Creates single edge on bottom of pot. F. Can be used to create a rounded edge on a large pot. It is great for hand building as well as throwing.